Jakarta Governor, Anies Baswedan officially opens Sunter Lake Festival in Sunter Lake area, North Jakarta.
" 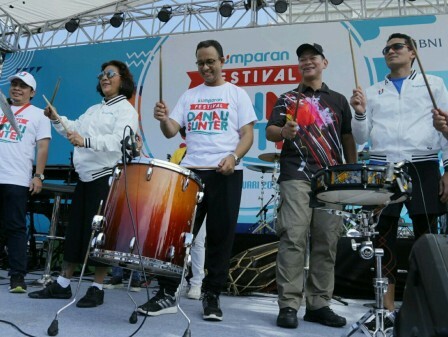 It could be an annual agenda"
The festival enlivened by the swimming competition between Jakarta Deputy Governor, Sandiaga Uni with Maritime Affairs and Fisheries Minister Susi Pudjiastuti is crowded by thousands people. "This morning we are so happy, we will see the swimming competition between Mr. Sandi with Mrs. Susi. Herein we also invited many swimming athletes and disabled athletes in the festival," he expressed, Sunday (3/25). According to him, the festival can be continued in future. Even, it could also by involving the mayor and regional heads. "It could be an annual agenda," he stated. He wants the cleanliness of the lake and other lakes in Jakarta to be maintained. "Lake can be a tourist attraction and felt directly by the locals," he said.